1. Affording or creating shade, shady, coolness. 2. Easily offended, or likely to become irritated. An umbrageous tree is a shade tree; but an umbrageous person is one who is quick to take offense or who is angered by some statement. Shadiness; as the umbrageousness of a tree. 2. A conical shadow excluding all light from a given source; specifically, the conical part of the shadow of a celestial body excluding all light from the primary source. 3. The central dark part of a sunspot. 1. Of or pertaining to the shade or darkness; shadowy; unreal; secluded; retired. Living in shaded places or shadows. 1. Pertaining to creatures that prefer to live in areas where there is no direct light from the sun. 2. 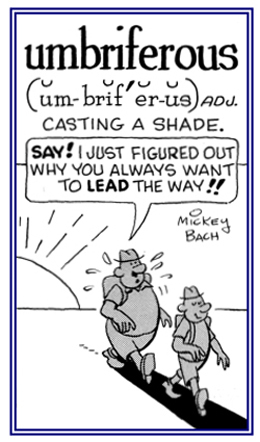 Etymology: from Latin umbraticola; from umbra, "shade" + colere, "to inhabit". 1. A portable, collapsible divice for protection against the sun, rain, and snow consisting of a fabric canopy mounted on a sliding framework of ribs radiating from a central rod. 2. Something that covers or protects, as military aircraft shielding ground operations. 3. Something that encompasses or covers many different elements or groups. 4. In zoology, the contractile, gelatinous, rounded mass constituting the major part of the body of most jellyfish. A brown heron type of African bird, Scopus umbretta, having the head so crested as to resemble a "claw hammer" and so also known as a "hammerhead". A reference to someone or something giving or causing shade or a shadow: Ted thought it was wonderful to be able to lie down under the umbriferous trees in his backyard and to enjoy the coolness from the hot summer sun. © ALL rights are reserved. A visor on a helmet to protect the eyes from light. Other related "dark; shadow, shade; black" units: lygo-; melan-; nigri-; nocti-; nycti-; scoto-; skio-. Showing page 3 out of 4 pages of 46 main-word entries or main-word-entry groups.